If we detect oxygen in the atmosphere of an alien world, does that mean life is present? Not necessarily: Scientists say the chemical signature of biological activity is likely to be more subtle, involving a mix of gases that might seem out of whack. 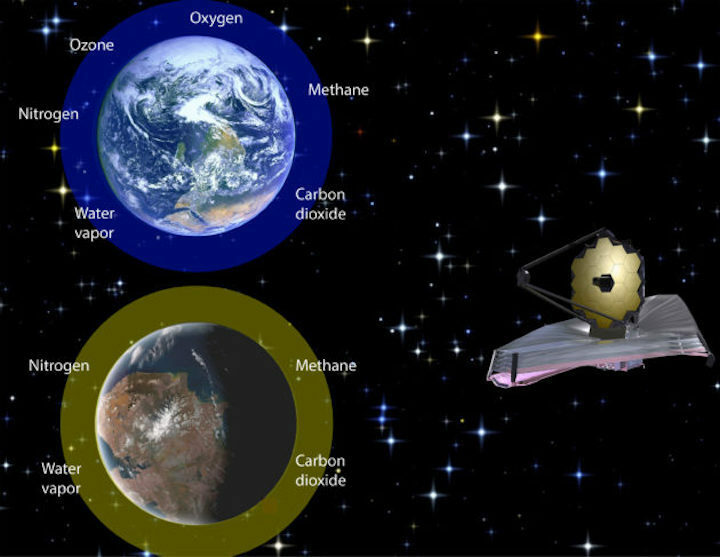 In a paper published today in Science Advances, researchers say future observatories such as NASA’s James Webb Space Telescope should look for the signature of atmospheric gases that would be in disequilibrium if it weren’t for biological processes. The study’s lead author, Joshua Krissansen-Totton of the University of Washington, says looking for oxygen alone shouldn’t be the sole strategy in the search for life on extrasolar planets. He and his colleagues propose an alternative chemical formula to look for: methane plus carbon dioxide, minus carbon monoxide. The formula was derived by looking at what scientists believe is the early history of Earth’s atmosphere, before oxygen came to dominate. It aims to rule out non-biological methods of producing methane. In addition, the researchers assume that carbon monoxide wouldn’t build up in the atmosphere of a planet with life. It’s not too early to figure out the formula to use when looking for life: The James Webb Space Telescope is scheduled for launch in 2019, and other future telescopes are also likely to be capable of analyzing the atmospheres of planets far beyond our solar system.